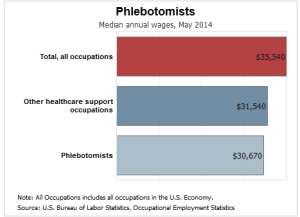 No Comments on How Much Does a Phlebotomy Technician Make? The Library of Congress has more than 162 million items. One little item is a helpful guide to bloodletting, based on the phases of the moon. Published in 1516, it follows an ancient tradition of relieving medical maladies by draining blood from the patient. Today doctors would not look favorably on tapping sick people, but doctors do require blood for analysis and diagnosis. The job of getting that blood falls to trained phlebotomists (from the Greek, phleps, meaning “vein;” tomia, meaning “cutting”) who carefully draw blood, keep precise records, and preserve blood specimens for use by other medical professionals. It can be a rewarding, worthwhile, and valued career. One way to select a new career path is to determine your costs to acquire all the skills and knowledge of the new vocation, and weigh that against the income the new job offers. Enrolling in a phlebotomy tech program is a streamlined process when you attend the right professional development center. Take a sixty-hour (ten-week) course and follow up with an externship of eighty hours, and you are ready to sit for your national examination. Consider what economists call the “opportunity cost” of this path. Opportunity cost is what you have to give up to get whatever you want. Suppose you opt for a fast-food lunch alone. Your opportunity cost is the total monetary cost (food, gas, and time) of the lunch plus the inability (the additional “cost”) to instead have a picnic lunch with your child at the park. The opportunity cost of becoming a phlebotomist is very minimal. Two, three-hour classes a week (at night) in a phlebotomy tech program barely interrupt your current work and leisure schedule, but they do prepare you for a new career path. When ready, you have no need to seek out the exam, either, if it is conveniently offered where you studied. Unlike, say, taking up a franchise operation, you have almost no up-front investment in specialized equipment or real estate. And unlike a full undergraduate program, the phlebotomy tech program is done (start to finish) in around three months. You give up the stresses and headaches of a job you may have but not want, and gain the power of pursuing a career (or even improving a career you’re in, like medical assisting!). 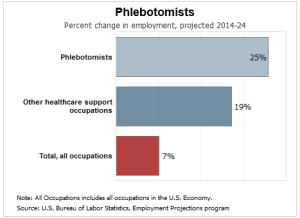 The BLS predicts job growth for phlebotomy technicians of 25 percent from now through 2024. 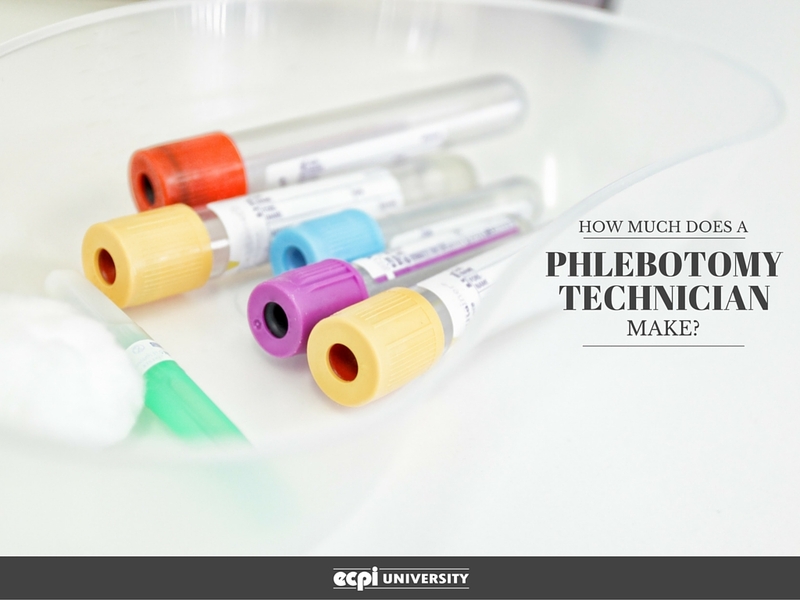 Since you can acquire the skills to become a phlebotomist through a phlebotomy tech program in as little as three months, you could easily tap into this job growth and spend many years watching your income grow. Seeing Red: Is Phlebotomy for You? From routine blood analysis to helping blood donors save lives, phlebotomists perform helpful and valuable work every day. With the right training and careful attention to coursework in a phlebotomy tech program, you can take and pass the national examination and be ready to work in many settings, such a medical centers, insurance agencies, doctors’ offices, medical laboratories and more. Attend the phlebotomy tech program at ECPI University’s Professional Development Center and get ready to take the national examination. The Professional Development Center schedules classes with working adults in mind and knows your time is valuable. Get the skills you need to find your new direction as a phlebotomy technician. Contact ECPI University today!